Yesterday just before Juma’a prayer, Mawlana received a visit from members of the Jordanian Hashemite Royal family. Despite his health condition, Mawlana said that he had to deliver an important message to His Majesty, King Abdullah. His honorable guest, the Hashemite Prince, had not come to visit him by coincidence. Our camera was open to film a private message to His Majesty when Mawlana said that all the people need to hear and be warned abut the content of this message since it involves all Arabs and all Muslims. He ordered us to broadcast the message with full translations. O Great King, Honored & Blessed King, the king of Jordan, from the family of the Prophet (saws) who is the representative and carrier of …. Who is carrying Arabs, and also carrier of all Muslims. And the nation now is without an Imam and a Caliph that represents the Prophet (saws). And now, there is no one in the East and West of the world who can carry the load of the family of the Prophet (saws). He will be with Mahdi (as). The time from the Prophet (saws) till now… The honour of the descendants of the Prophet (saws) is within the power of his Royal Highness the King of Jordan, Jordan. His Royal Highness King Abdullah. I am a poor servant. This addressing is for His Highness. Subhana Allah, how many years have passed since & now right under my eyes, a King! His Royal Highness King Abdullah. Now he came, he is one of Allah’s (swt) lions! He has pointed out that he is a desert lion! Subhana Allah! And he is now on the throne of Jordan and he is pressured from all directions. I was writing on behalf of the people of Truth. Mawlana Shaykh used to say to his Majesty Prince Hussain, may Allah (swt) bless him, that it will be given to King Abdullah 10 countries…countries which will be under his rule. Now we have reached the time where the Muslim people are remaining in the hands of the tyrants – these cursed ones! Forget. They have forgotten! And the tyrants came & tried a thousand tricks for the people to forget the Caliphate & the Kingdom of Islam. They forgot & now they have all fallen. The whole Islamic world does not have a place or a way out because they have become completely lost, Subhana Allah! This servant is a servant to His Majesty the King – if he accepts, my age is almost, Allah (swt) knows. I received a message that these tyrant people in the land of Sham. I received the message, what His Majesty the King should do. Sham is open, there is no one there. Why he is not organizing himself? Who is he fearing? This addressing is for His Majesty. He was hesitant, but support is coming, support is coming for His Majesty to make a move and declare that he is the Khalifa and that he is the last King who will raise the flag of Islam. I received this message so my message to the King is that he should not hesitate. Because he is representing Ahl Al Bait and is the real inheritor of the descendents of the Prophet (saws). Go and do not fear! Declare that, “I am the inheritor of the Prophet (saws) of the end of times & I am the one who will gather the Muslims & will throw away the tyrants from the whole area, in 10 countries”. Subhana AllahAl ‘Aliy Al Azim, these news Allahu Akbar Al Akbar! He declares! He must declare that he is the inheritor to be the Khaliph from Rasulullah (saws). “I am the one who will raise the Banner of the Prophet (saws)” And so he should have three regiments, his Majesty. 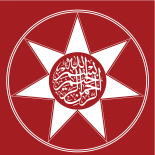 The Regiment of Sayidina Muhammad (saws) The regiments of Mahdi (as) and his Majesty’s regiments. Three, he should raise the banner & march. I am the first one to give him allegiance! From here I have given him allegiance. And I declare this order to the whole Muslim world that he is the inheritor and that he has to raise the banner of Islam & that he will be victorious & will gather the whole 10 countries under his ruling. Then Mahdi (as) will come from his side from Qadam, in Sham. And he is the King of Sham, His Majesty King Abdullah. 3 Regiments will stand and march. And he should declare, “I am the real inheritor of my Great Grandfather, the Master of beginning & end (saws). I represent him. I want the allegiance from all people, from all the Muslims.” And I am the first to stand & give him allegiance, because he is the King of this time, King Abdullah. I am seeing him in the company of Imam Mahdi (as) with 3 regiments. The Regiment of the Prophet (saws), the Regiment of Mahdi (as) & his regiment. Three Regiments & he should march. I am a weak servant. Who listens to me they should give him allegiance for Allah’s (swt) sake. Because who does not give allegiance, is not Muslim. I gave my allegiance to His Majesty for Allah’s (swt) sake. And who is present from the Awliya’ also have given him allegiance. So he should march. And I order everyone who is listening to this weak servant, to offer him their oath. From all over the world, everybody has to give their allegiance, because he is honoured in dunya & in Akhirat. He is the Deputy/Khalifa of Islam, and I declare that he is the one. The right is only for him. Let them give their allegiance to him, or they will be destroyed. This is the addressing that you came to hear. I was waiting for you. Let him prepare the regiments and declare that he is the Khalifa of Rasulullah (saws) now present & representing Ahl Al Bayt & representing Mahdi (as) until he comes. Let him march! Let him march with the permission of Allah (swt), Order of Allah (swt) & with the Power from Allah (swt). O your Majesty I ask forgiveness, O your Majesty King Abdullah of Jordan. You are the most suitable for the Islamic Khilafa/Deputy that the tyrants kicked out from his center and it will return in his hand. Now His Majesty is the Khalifa of Rasulullah (saws) who is representing Ahl Al Bait until the appearance of Mahdi (as). 3 Regiments will accompany of him in his march. Al Hamdulillah I have declared & I am a weak servant & first one to give allegiance to his Majesty, because he is the Khalifa/Deputy of Rasulullah (saws) and supporter of Al Mahdi (as) & will be with Mahdi (as) entering Sham, Baghdad, Egypt, Libya, Yemen, all the Arabian Peninsula, Turkey & Kurds, all of them. You came today for this matter and it came to me this addressing, an order to address His Majesty, not to fear and to march with no fear! Because His Majesty is supported. May Allah (swt) raise his banner, and all the Arab tribes – they should give him support & their allegiance. Those who support him will be from the people of Paradise. O your Majesty may you accept the first allegiance, my allegiance. And who listens to this weak servant, give him allegiance. Give him allegiance & insha’Allah Islam shall stand up supported with Heavenly Power. Allah (swt) sent you, your Highness Prince Abbas. Be with him, all the tribes. Who will go against him will be destroyed, destroyed & perish, destroyed. And those who will give allegiance to him will be honoured in dunya & Akhirat. Tawba Ya Rabbi. I offer him the first allegiance, my allegiance to the owner of the Message, to the Imam of the Muslims & his Khalifa/Deputy. He is the only one. There is nobody else. This is what I was ordered & I have declared it. O your Majesty accept, accept, accept… write my name first or last, that I have given you my allegiance. Insha’Allah on Judgment Day it will be written, the honour of having given allegiance to your Majesty as support to Islam. And the armies of the Heavens support him, he should not fear. Fatiha. I kiss his honourable hands & feet, His Majesty the King. Fatiha. Bismillahi r-Rahmani r-Rahim… This is for you. His Highness Prince Abbas, you became the means. He has power, masha’Allah! Masha’Allah… Congratulations to Ahl Al Bait in Jordan. Haqq/Truth is raised & nothing can rise above it. He is on Haqq & we are with Haqq. Who goes against Haqq is defeated. Allah (swt) defeats them. “Sayuhzamu Al-Jam`u Wa Yuwalluna AdDubura”(54:45) The Holy Verse says. Who is opposing, there is only defeat for them here & in the Hereafter. Welcome to you Sayyidi. Take Baya’… Kiss his hands & his feet, he is Sultan. May he look to me.. May he look to me.. The treasures of the world are under his feet. Fatiha. Who opposes this, has no future. Finished! They will all be defeated because he has the power. Could any one on this site remove this extremely offending and unacceptable commentary please? And could you block anyone who is trying to degrade the truth? That would be extremely appreciated. We apologize for letting that comment pass. Shukran! May Allah bless you. This entry was posted on April 30, 2012 by ASFC in Politics, Spiritual Experiences and tagged Arabs, Bani Hashim, islam, King, King Abdullah II of Jordan, Monarchy, shaykh nazim.